Arsenal lived up to their nickname of ‘second-half FC’ earlier today when they came back from 2-1 down to defeat North London rivals Tottenham 4-2. Tottenham star Dele Alli was kept quiet for the entire second half, the England international’s passing stats for the half have been revealed and they are embarrassing to say the least. A shocking stat shows that Alli only made 6 passes during the entire second period – 4 of which resulting from kickoffs. The stats also show that that the attacking midfielder only made one pass in Arsenal’s half after the halftime break. Dele Alli completed 6 passes in the second half vs Arsenal. Unai Emery’s men completely blew away their rivals in the second half of action. 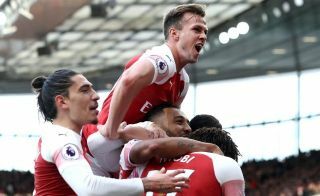 The Gunners got themselves back on level terms when Pierre-Emerick Aubameyang scored a lovely goal in the 56th minute of the match. Arsenal scored two goals only three minutes apart when Alexandre Lacazette and Lucas Torreira scored in the 74th and 77th minutes respectively to seal the derby day win for the Gunners. Alli’s biggest contribution today was in a melee with Aaron Ramsey after Eric Dier scored to make the score 1-1, just half an hour in. Alli and Dier were made to rue their provocation of Ramsey when the Welshman came on at halftime and single handedly spurred Arsenal to victory with two assists after coming off the bench.